The all new Kia K900 is a stunning new luxury sedan that will only be available to those in the Middle East, United States and South Korea. The K900 will become a direct competitor of the Mercedes S-Class, Audi A8, BMW 7 Series and Jaguar XJ. With a 5.0-litre V8 engine, Kia says this will be the most powerful engine they have ever created. The interior will be of the highest tech, with a screen dominated dashboard, fine leather, woods and metal, along with plenty of space. 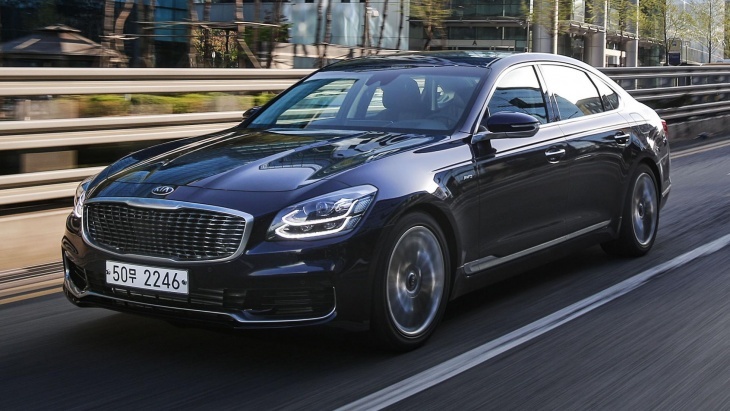 It won’t be long before the Kia K900 will be spotted in our Homeland, and is expected to be a very popular choice in the Middle East, with the Asian car manufacturer already experiencing strong sale figures in the region. Here are a collection of shots of the Kia K900 that show the full design of the car, as well as official release photos of the exterior, interior and stunning dashboard.